Have you ever heard of neuro-linguistic programming, commonly referred to as NLP? Neuro stands for brain, linguistic refers to language, and programming is how neural language functions. What if there were special NLP techniques that could help you crush those 2019 sales goals? 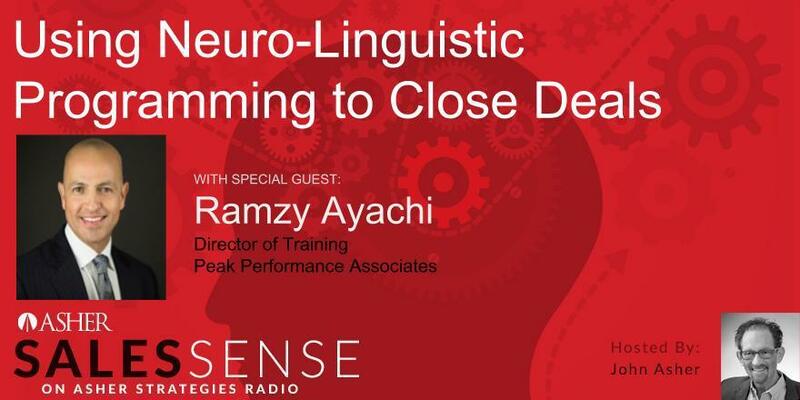 On this Asher Sales Sense Podcast, Marine Corps veteran and Master NLP Practitioner Ramzy Ayachi will discuss “Using Neuro-Linguistic Programming to Close Deals Faster.” Ramzy is an expert in real life situations where he had to use mind strength to survive. Now his passion is equipping salespeople and others in high stress occupations with mental skills not only to survive, but to thrive. 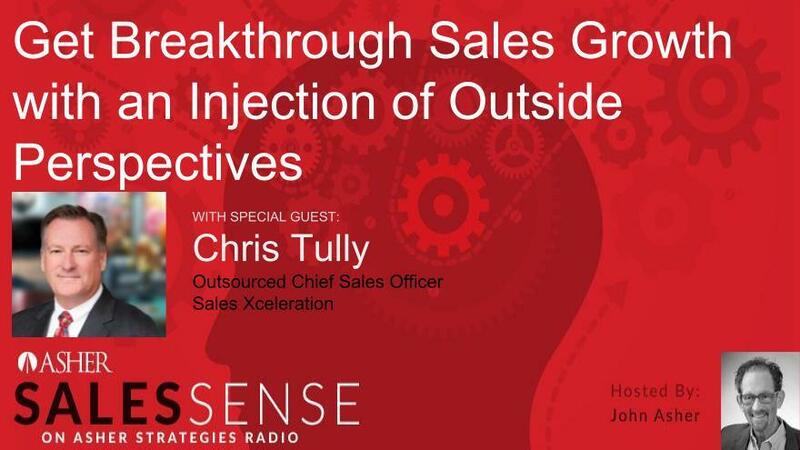 Listen in and learn how you can become an unstoppable sales success machine. Peak Performance Associates Director of Training Ramzy Ayachi is a Board-Certified Hypnotist, Master Neuro-Linguistic Programming (NLP) Practitioner, a Certified Master Trainer for Hypnosis and NLP, and Marine veteran. He’s our team’s secret weapon! With over two decades of leadership experience in the "trenches", while serving as an active duty Marine honing his own style of leadership and mastering the practical psychology of human performance behavior, Ramzy is an expert from real life personal and professional challenges, not just theory. He found himself in multiple and difficult life situations and finding his way out became a “must”, not just a “nice to have”. His unique skill is to equip his clients with the reproducible science of achievement. 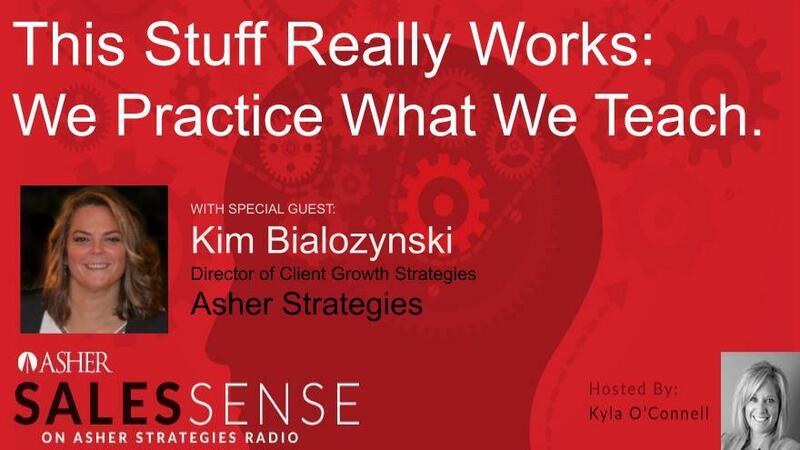 Ramzy knows what works and what doesn’t and works together with his clients to facilitate change. He believes we all have room for growth and that knowing is the enemy of learning. Ramzy has seen it and done it, succeeded, failed, and succeeded again, mastering the art and science of achievement. Whether providing one-on-one services, leading a workshop, training professionals, Ramzy is a charismatic and highly-effective coach. A natural teacher, mentor, and trainer, Ramzy instinctually and expertly guides individuals and groups to deep, powerful change. His successes include top-level executives, sales leaders and teams, political appointees, congressional representatives, federal service and military, defense contractors, couples, and professional athletes with issues ranging from eliminating unhealthy sales team dynamics, eradicating limiting beliefs of sales personnel, and reinforcing a culture of excellence within an organization. What if you could quickly access expert advice on how to accelerate your sales process? Would that be worth a little of your time? Tune in to the next episode of "Asher Sales Sense" on Thursday at 3PM Eastern. 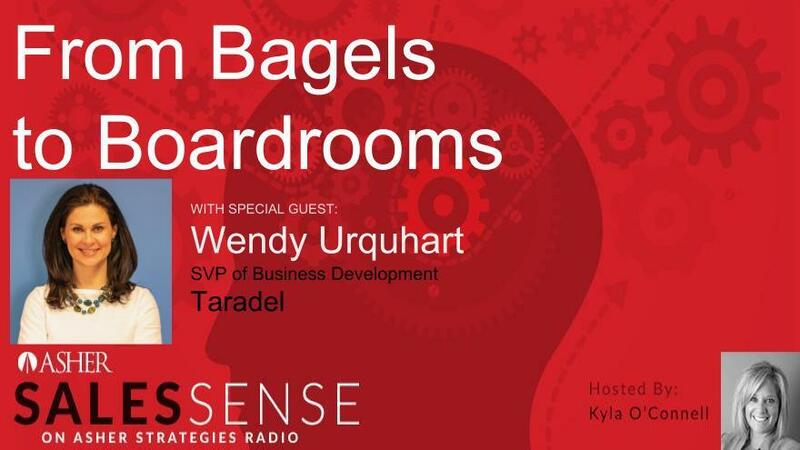 The guest this week is Fred Diamond, Executive Director and Co-Founder of the IES. 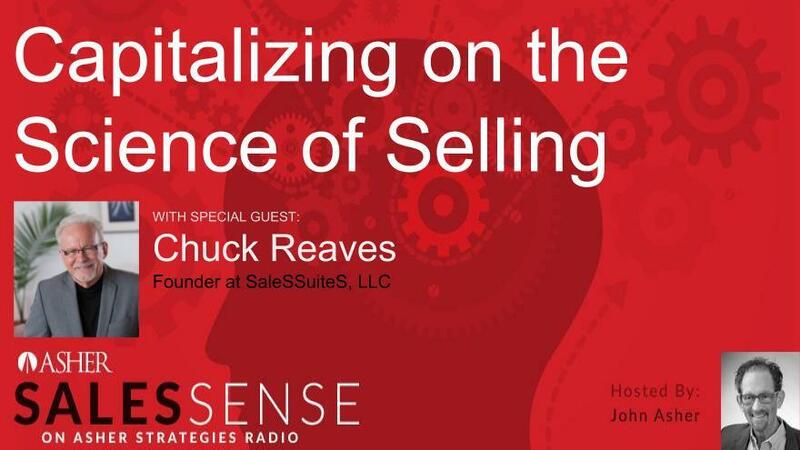 Fred discusses why he founded the IES and what sales managers and salespeople get from this member organization. You'll learn the four things every sales manager struggles with in order to succeed. In addition, Master Sales Coach Kyla O'Connell interviews Fred on “The Top Five Things Sales Pros Must Be Doing to Be Successful Today." Fred was a top marketing consultant for Microsoft and Oracle before he started the Institute for Excellence in Sales (IES), a popular and trusted forum for sales training, programs and services. The IES connects top sales speakers, authors and trainers with sales leaders to help selling professionals become more successful. Learn what Fred thinks are the top things you could be doing – now – to get the sales results you've only dreamed about. 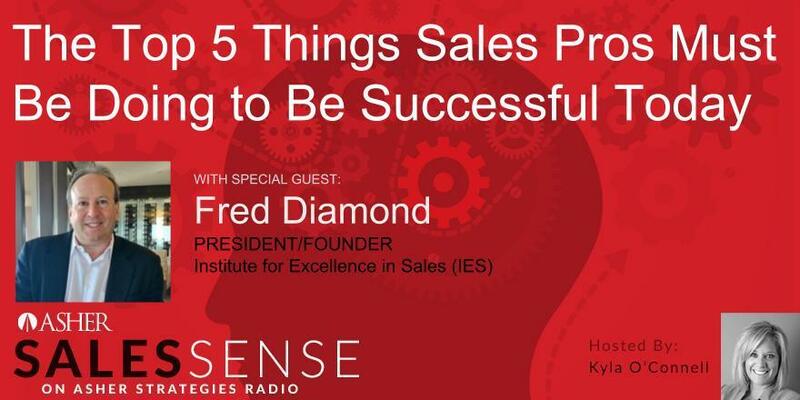 Fred Diamond is the co-founder and president of the Institute for Excellence in Sales (IES) based in Washington DC. The IES is the premier organization devoted to helping sales leaders hire, retain and motivate top tier sales talent. Under Fred's leadership, IES has become the industry's trusted partner for sales training, speakers, programs, and services. 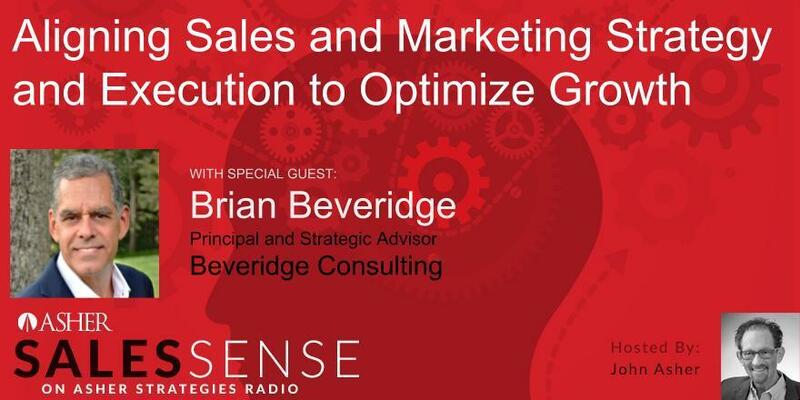 Fred is also the host of the popular Sales Game Changers podcast. The IES connects the top sales speakers, authors, and trainers in the world to sales leaders. IES also helps organizations determine the best sales training partner to engage with and run sales training programs for them. Many people knew Fred as a world-class marketing consultant to companies such as Microsoft and Oracle before he started the IES. His motto, "Marketing that doesn't lead to revenue reward is a huge waste of time and money" demonstrated that it's about accelerating the sales process. You’ve been great at the selling game. So great that your company promoted you to Vice President of Sales. But the joy of the announcement has given way to near panic as you realize you now have to step up to meet big company goals. You’ll need to develop sales talent and put a structure in place to help your salespeople succeed. Wouldn’t it be great to know how someone else faced this challenge and thrived? The upcoming Asher Sales Sense Podcast – “Adding Structure to a Sales Team and Department” – with Thorne Vice President for Sales Phil McDonald might be just what you need to hear. Asher Senior Partner and Sales Facilitator Kyla O’Connell will guide the conversation including topics such as: understanding how to develop technical salespeople, adding structure and repeatable processes to a sales department, and lessons learned as a VP of Sales for a major vitamin and supplement manufacturer. Tune in and find out how a newly-installed VP Phil McDonald, despite facing additional complications of a cross-country staff relocation and a hurricane, organized his sales team for success. As Vice President of Sales for Thorne, Phil leads Thorne’s U.S. Sales Force to profitably grow sales and revenue for the company’s portfolio of nutritional supplements sold through healthcare practitioners. Phil works closely with Thorne’s Marketing, Customer Service and Medical Affairs teams to ensure Thorne’s practitioner-customers receive best-in-class support from the Thorne Sales Force. Phil has over 35 years of experience in sales, sales management, and training, including 22 years in the nutritional supplement industry. Prior to joining Thorne, he worked with the Perrigo Company, the nation’s largest supplier of store brand OTC products and nutritional supplements. As a National Account Manager, Phil was responsible for sales at many of the nation’s largest retailers including CVS, Target, and Kmart. Phil also spent 13 years in pharmaceutical sales including 4 years in sales management for SmithKline prior to their merger with Glaxo. Phil’s professional development includes certification as a trainer for Professional Selling Skills, Account Development Strategies, Investment in Excellence, and Advanced Communication Skills. If you are thinking of video marketing, start by listening to John Carter and John Asher. 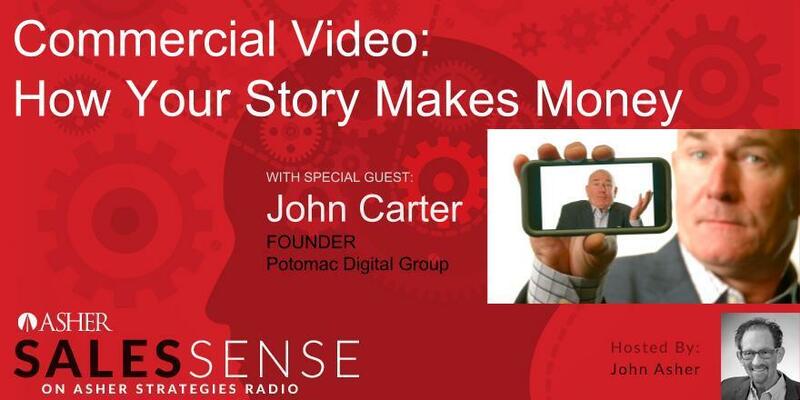 This episode of the Asher Sales Sense podcast features John Carter, founder of the Potomac Digital Group, being interviewed by John Asher. In producing over 1,000 successful commercial video campaigns for websites and smartphones, Potomac Digital has uncovered the best ways to stimulate buyer engagement with audiences. What’s the DNA of your company? How do you turn your website into a sellsite? What’s the most effective way to wrap your narrative into buyer-attractive video? If more of your market (state your primary market) only knew _____ about your products and services, they would buy or engage with you. Whether we are doing a simple interview or using multiple locations to tell a story we always remember that buyers will remember the product or subject matter when it is wrapped in a narrative. Humans process a motion picture/video story thousands of times faster than reading. They also make buying decisions on smartphones which are perfect for video. Why ask them to read at 200 WPM when you can show them on their own handheld TV screen?